Superior Locks Canberra is proud to announce they are now members of Master Locksmiths. To celebrate this achievement, we thought we’d write this blog post outlining the benefits you receive when you engage the services of an MLAA (Master Locksmith Association) member. What is the Master Locksmiths Association of Australasia? Locksmiths no longer simply cut keys. Locksmiths are security professionals and perform a vast array of services including installing alarms, opening safes, and designing restricted master key systems. Therefore, it is important that, like other trades, there is a professional body overseeing the standards of locksmiths as well as their professional development. There are 3 very important reasons why you should only choose an MLAA member for your locksmithing requirements. MLAA members are qualified and experienced security professionals whose work is of a superior standard. In other words, when you engage an MLAA member, you know you are receiving the very best service, advice and workmanship. Don’t trust the security of your home, property or person to just anyone. Looking for a reliable Canberra Locksmith? 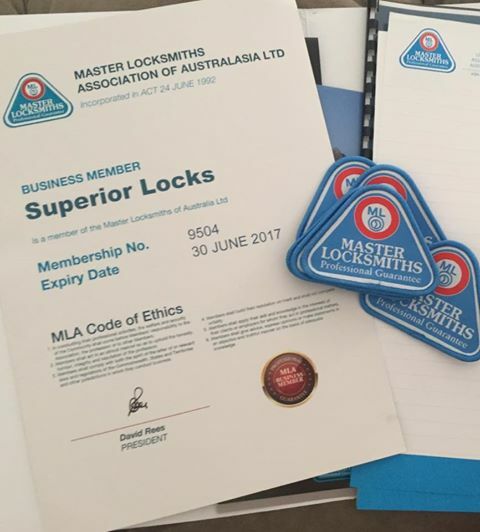 Superior Locks are proud members of the MLAA – the best locksmiths Canberra has to offer! Call us today.